Q: I got away from my abuser five months ago, and while at least I'm not on the streets anymore, it's still extremely, extremely hard. I’m disabled and I don't have any support. I don't have anyone to talk to. And now I'm trying to move to another state because he found me again. I don't think I can do this anymore. - Deborah T.
You’re obviously dealing with a lot, but take a moment to be proud of yourself for getting away from your abuser and staying away for five months. That’s no easy feat. There are a lot of barriers that can prevent a survivor from leaving for good and you persevered through them. But going at it alone is tough. Everyone needs a support system, especially if you’re also dealing with a disability. According to the World Health Organization, those with physical disabilities are 1.5 times more likely to be victims of violence than those without. Those with mental health disabilities are 4 times as likely to be victims. The factors that can put people with disabilities at a higher risk of violence include stigma, discrimination, lack of education about one’s disability and a lack of support for those who care for them. Communication impairments also hamper a disabled person’s ability to disclose abuse. Abusers who are able-bodied often use that against a survivor with a disability, saying things like, “No one will believe you because you’re disabled.” They may try to gaslight you into thinking your disability is all in your head. Or, they may try to convince you that there are no services available to help you because of your disability. They may make you feel like you can’t survive without their help. These things may still be ongoing given you’ve said your abuser has found you again. I think the most important thing for you to do right now is find an ally, someone you can talk to, even if it’s just to vent your fears or frustrations. 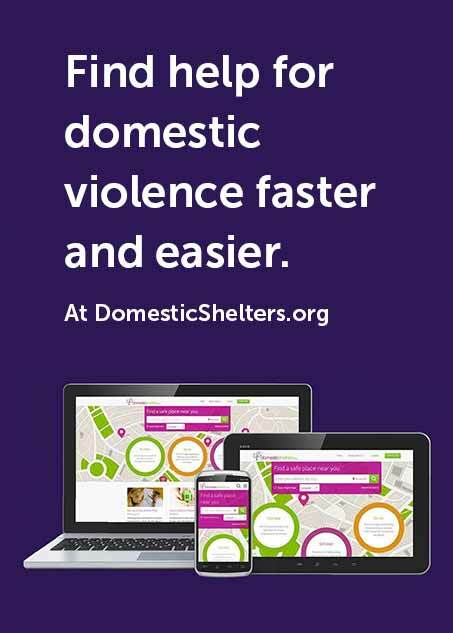 A trained domestic violence advocate can help you locate services in your area that can help you, such as an emergency shelter if you feel you’re in danger, can help you secure an order of protection, find a support group, even relocate to another city if necessary. If you haven’t already, head to our Find Help page and type in your ZIP code. A list of nearby shelters will appear. Consider calling one of them or call the National Domestic Violence Hotline at 800-799-SAFE. You may want to ask them about services in your area specifically aimed at helping disabled survivors, like Colorado’s The Initiative (their hotline is 303-839-5510) or Seattle’s Abused Deaf Women’s Advocacy Services (survivors can use a videophone to call 206-812-1001). Also, be aware that the Americans With Disabilities Act protects you from discrimination when seeking social services such as emergency shelter. Shelters must be accessible to persons with disabilities, so no matter what your abuser has told you, there are services out there to help you. You may also want to read this previous Ask Amanda column where reader Emily asked how to keep going after abuse. Some of what we told her may help you, Deborah, such as taking steps toward self-care. Creating an emotional safety plan may also help you sort through your feelings—read the 4 steps to doing so here. Just reading the Survivor Stories on DomesticShelters may help you feel a sense of community, Deborah. We hope you know you’re not alone, and there is a reason to keep going. Ask Amanda: How Can I Stop My Cyberstalker?